Most people, including medical experts and social scientists, struggle to understand the implications of this matrix. This is no surprise when considering explanations like the corresponding article on Wikipedia, which squeezes more than a dozen metrics out of four essential frequencies (hi, mi, fa, and cr). While each particular metric is quite simple, their abundance and inter-dependence can be overwhelming. Fortunately, the basic matrix is also known as 2-by-2 contingency table, actually quite simple, and its implications rather straightforward. In the following, we aim to disentangle the profusion of measures and summarize those parts of the confusion matrix that a risk-literate person really needs to know. Fortunately, this is not so confusing any more. And, perhaps surprisingly, all other metrics follow from this simple core in a straightforward way. In the following, we illustrate how the other metrics can be constructed from the 4 essential frequencies in the core of the matrix. each individual’s decision, which can either be positive (TRUE) or negative (FALSE). hi represents hits (or true positives): condition present (TRUE) & decision positive (TRUE). mi represents misses (or false negatives): condition present (TRUE) & decision negative (FALSE). fa represents false alarms (or false positives): condition absent (FALSE) & decision positive (TRUE). cr represents correct rejections (or true negatives): condition absent (FALSE) & decision negative (FALSE). Example of a 2x2 confusion table in riskyr. Arranging a 2x2 confusion table by condition and by accuracy. Misses mi are often called “false negatives” (FN), but are nevertheless cases for which the condition is TRUE (i.e., in the cond_true column of the confusion table). Correct rejections cr are often called “true negatives” (TN), but are nevertheless cases for which the condition is FALSE (i.e., in the cond_false column of the confusion table). Thus, the terms “true” and “false” are sometimes ambiguous by switching their referents. When used to denote the four essential frequencies (e.g., describing mi as “false negatives” and cr as “true negatives”) the terms refer to the correspondence of a decision to the condition, rather than to their condition. To avoid this source of confusion, we prefer the terms mi and cr over “false negatives” (FN) and “true negatives” (TN), respectively, but offer both options as pre-defined lists of text labels (see txt_org and txt_TF). Similarly, it may be tempting to refer to instances of dec_cor and dec_err as “true decisions” and “false decisions”. However, this would also invite conceptual confusion, as “true decisions” would include cond_false cases (cr or TN cases) and “false decisions” would include cond_true cases (mi or FN cases). Again, we prefer the less ambiguous terms “correct decisions” vs. “erroneous decisions”. While all accuracy metrics quantify the relationship between correct and erroneous decisions, different metrics emphasize different aspects or serve different purposes. We distinguish between specific and general metrics. The goal of a specific accuracy metric is to quantify some particular aspect of decision performance. 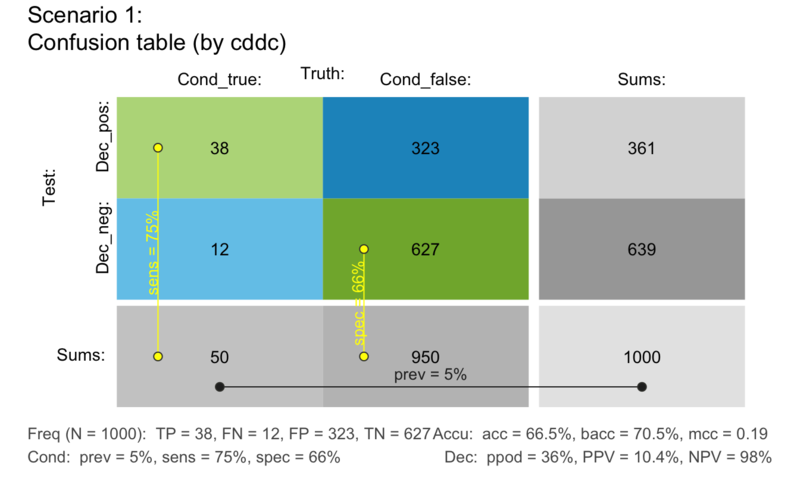 For instance, how accurate is our decision or diagnostic test in correctly detecting cond_true cases? 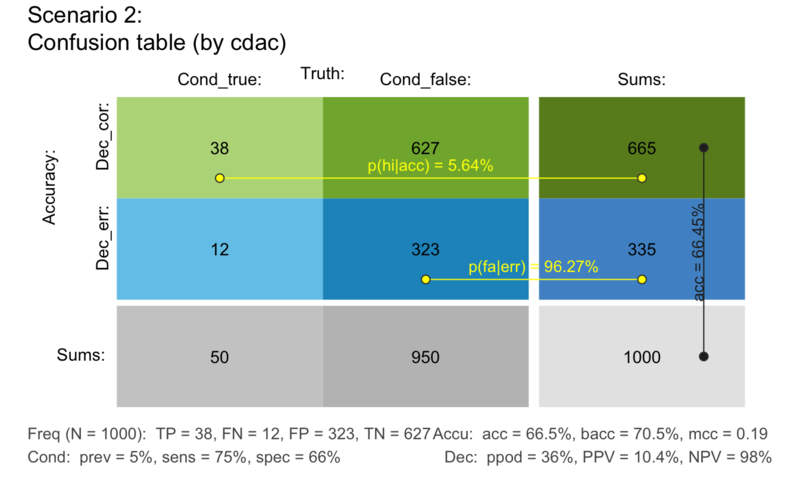 How accurate is it in detecting cond_false cases? Accuracy acc := Proportion or percentage of cases correctly classified. Weighted accuracy wacc := the average of sensitivity (sens) weighted by w, and specificity (spec), weighted by (1 - w). If w = .5, sens and spec are weighted equally and wacc becomes balanced accuracy bacc. If 0 <= w < .5, sens is less important than spec (i.e., instances of fa are considered more serious errors than instances of mi). If .5 < w <= 1, sens is more important than spec (i.e., instances of mi are considered more serious errors than instances of fa). The mcc is a correlation coefficient specifying the correspondence between the actual and the predicted binary categories. 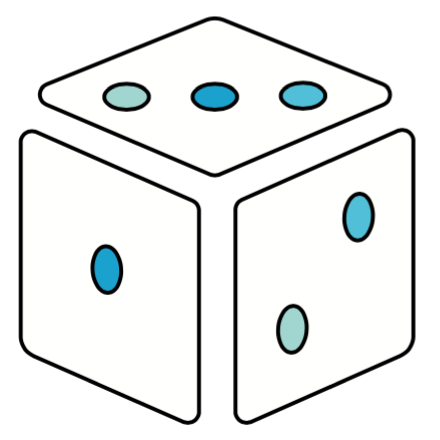 A value of \(0\) represents chance performance, a value of \(+1\) represents perfect performance, and a value of \(−1\) indicates complete disagreement between truth and predictions. See Wikipedia: Matthews correlation coefficient for details. See Wikipedia: F1 score for details.